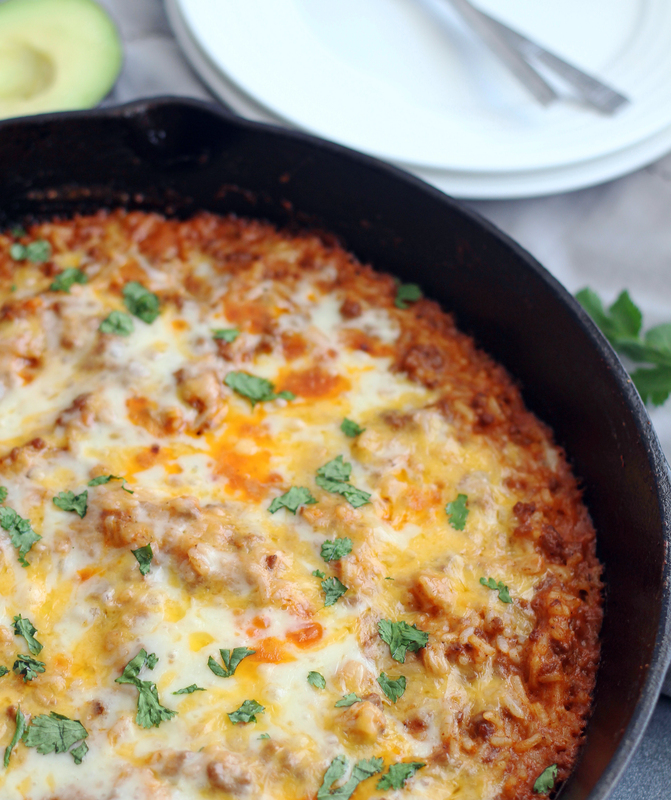 This Cheesy Taco Skillet Dinner is everything you could ask for in a skillet meal. It’s simple, fast, flavorful and completely satisfying. You will love this meal. Happy Monday to everyone. How did it get to be Monday again so soon? I hope everyone had a great weekend. As usual, I didn’t get everything done I was hoping to. It’s probably because I spent too much time indulging in my birthday present my boys gave me, they seriously make me laugh. Let me explain. I love (really, really love) the caramel sauce from Leatherby’s Ice Cream. Whenever we go there (which isn’t often enough) I order a small sundae with their toasted almond ice cream and caramel sauce, with an extra side dish of caramel. No whipped cream, no cherry on top, just the caramel sauce. It’s my absolute favorite. If you’ve tried it then you know how fabulous it is. I told my boys all I wanted for my birthday was a jar of their caramel sauce and a container of their toasted almond ice cream. 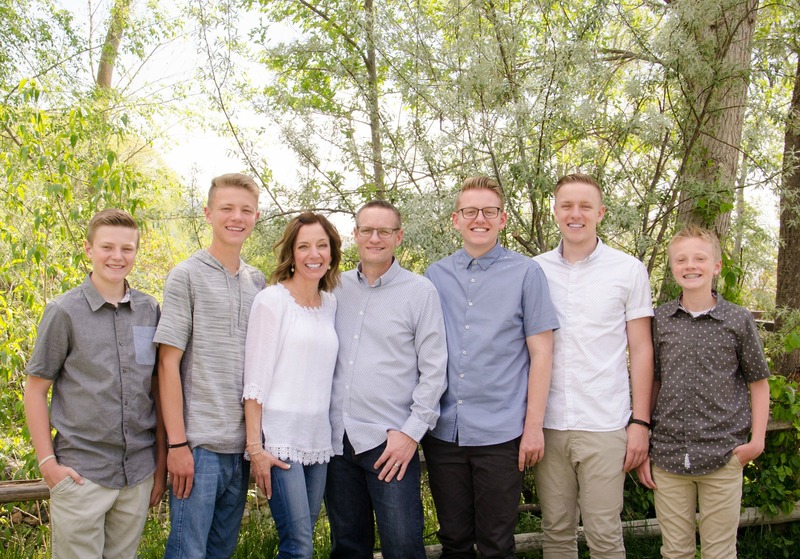 Being the awesome sons that they are, they remembered. Problem is, they didn’t just buy me the 16-oz jar of caramel sauce they sell and the half-gallon container of ice cream, oh no, they went a little crazy. They bought me a gallon of ice cream and a half-gallon of caramel sauce. I was laughing hysterically. They rock! So all weekend long I’ve been enjoying bowls of ice cream drenched in my favorite caramel sauce ever, usually twice a day, and now I really need to go run a marathon or two. 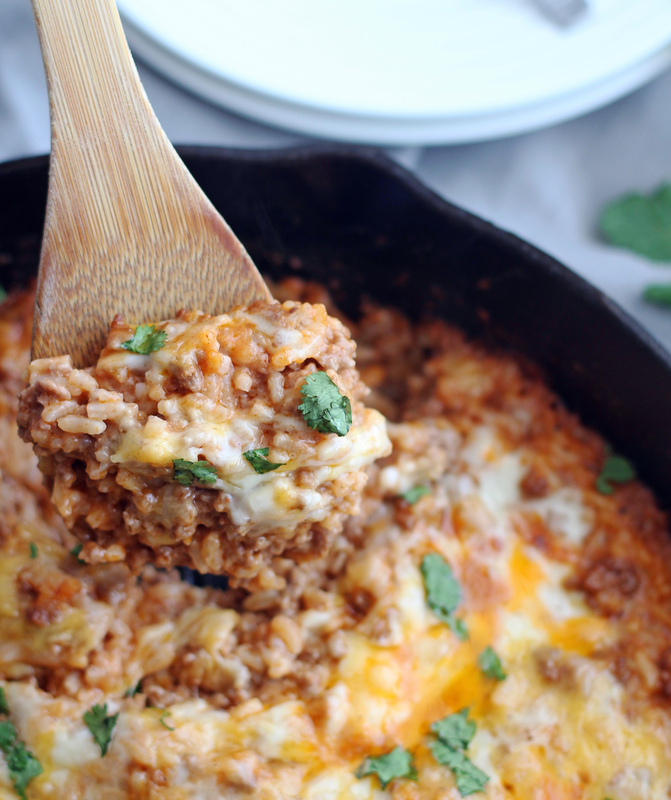 After my weekend ice cream binge, this Cheesy Taco Skillet Dinner sounds really good about now. We have fallen in love with this dinner. 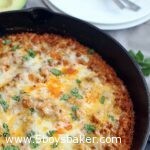 You all know how much I love skillet dinners and this is yet another one that is simple, super fast and absolutely delicious. Top it off with any of your favorite taco toppings and serve it with a green salad and you’ve got yourself a delicious, simple and really quick dinner. I have not made this with brown rice, but am going to try it. I'm sure it will be delicious. The recipe calls for regular tomato sauce, but you certainly could use a can of the Mexican tomato sauce if you want to give it a lot of kick. Preheat oven to 375 degrees F. In a large oven-proof skillet, heat olive oil over medium heat. Sauté the onion, stirring occasionally, until softened. Add beef, stirring to break up the meat, and cook until the meat is cooked through. Drain fat and return pan to the stove. Stir in McCormick Original Taco Seasoning Mix and flour and cook 1 minute. Add chicken stock (or water), tomato sauce. Bring the mixture to a boil. Reduce the heat to low and let simmer for 5 to 10 minutes. Stir in cooked rice, ½ c. cheddar cheese, ½ c. Monterey Jack, and sour cream. Season with salt and pepper to taste. Sprinkle the top of the casserole with remaining cheeses. Bake until top is golden brown, about 15 to 20 minutes. Garnish with desired toppings. Thanks Judy! Yes I’ll try it soon and report back. Jodi, this was so great. I made it last night using ground dark turkey, which is what I usually do for beef. And I used the already cooked organic brown rice from Whole Foods. It comes frozen, so I defrosted, measured, and threw it in. So easy, we all loved it, thank you! Happy you loved it Teresa. Love the substitutions you used and now I know it’s good with brown rice. Thanks! !